From the beginning of the nineteenth century, painting outside or “en plein air,” became the standard practice among artists, specifically landscapes. This method contrasts with studio painting or academic training, which was taught indoors. 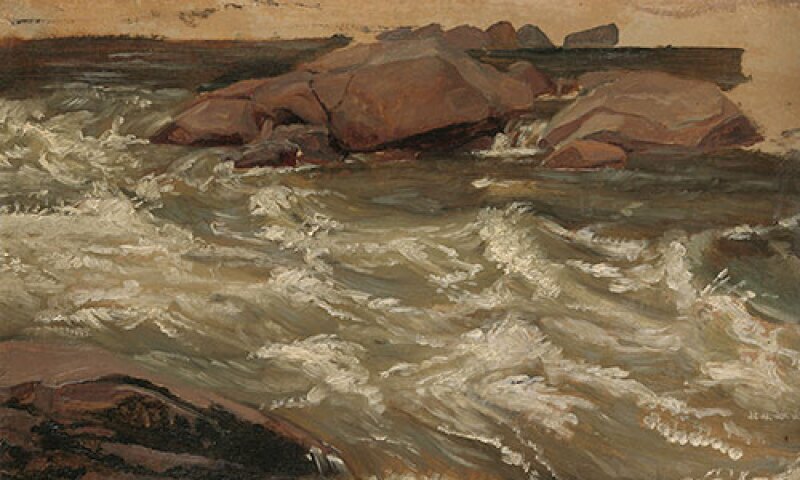 Water studies emerged as a recurrent motif for painters however, posed a challenge for artists learning to capture light, color, and texture in oil paintings. Large landscapes offered artists the opportunities for prolonged study, while water encouraged artists to grapple with depicting movement and the ephemeral effects of light and atmosphere. Artists often worked quickly to capture fleeting effects and developed innovative approaches to convey light and texture. These paintings illustrate the many facets of water depictions, the effort of journeying into untamed nature and discovering these motifs added to the intrepid nature of the enterprise. Featured in this selection are works by artists from France, Denmark, Switzerland, Germany, and Britain. Rivers and Torrents highlights works from the collection of oil sketches given jointly to the Morgan and to the Metropolitan Museum of Art in 2009 and 2016 by Eugene V. Thaw and his wife, Clare.